Last Chance... Final Deadline Tonight! Published on March 21, 2018 at 10:00 pm . WINNIPEG, MB, March 22, 2018 — This is your last chance to win a Grand Prize worth up to $1.44 million! Only hours remain to tonight’s midnight deadline in the 2018 St-Boniface Mega Million Choices Lottery. 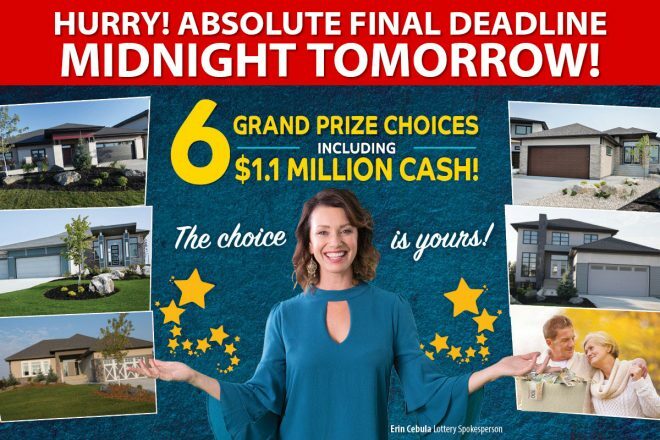 You have 1.1 million reasons to buy: 1 of 6 Grand Prize *Choices* — all worth over $1.1 million! Including home packages in Winnipeg, Charleswood, Headingley, and the Okanagan in B.C., plus cars, furnishings, and cash. Or choose $1.1 million tax-free cash and become an instant millionaire! Cash options on every single prize! Over 3,300 prizes, tons of cash to win. PLUS the 50/50 Plus™ jackpot — almost $1,000,000. Don’t miss this huge prize. And the Big Score PLUS™, with $162,000 to win – new winners every day for 61 days! When you purchase tickets, you’re helping save lives right here in Manitoba. Published on March 8, 2018 at 10:00 pm . 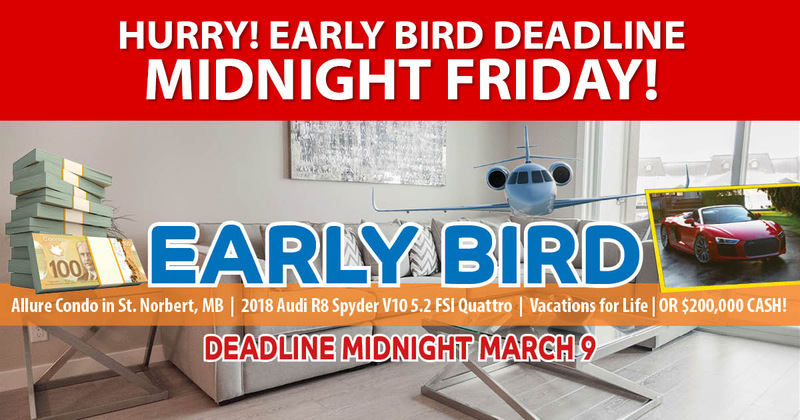 WINNIPEG, MB, March 8, 2018 — Don’t miss out on the $230,000 Early Bird prize in the St-Boniface Mega Million Choices Lottery. Only hours remain to the midnight deadline. There are four incredible options: a condo in St. Norbert by Irwin Homes, or a ‘Vacations for Life’ travel package, or an Audi R8 Spyder, or $200,000 cash. 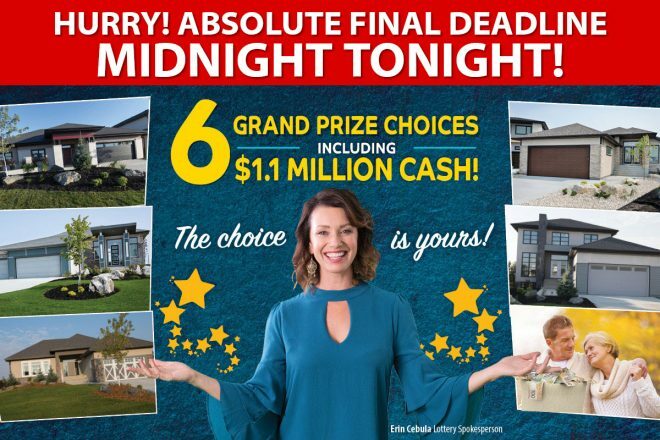 Plus, order now and you’ll be also be entered into the Grand Prize draw worth over $1.44 million — homes in Winnipeg, Headingley or Osoyoos BC. Become an instant millionaire with $1.1 million tax-free cash. Remember to get your 50/50 Plus™ tickets as well — the jackpot is over $800,000 and growing and the winner takes half. When you purchase a Mega Million Choices Lottery ticket, you’re helping St. Boniface Hospital raise vital funds for research and equipment, you’re helping to treat thousands of Manitobans every year, to provide them with critical, compassionate care – and you’re saying many things. You’re saying you want patients at St. Boniface to be diagnosed and treated with state-of-the-art equipment. You’re saying you want patients in palliative care to live their final days in absolute comfort, beauty, and dignity, surrounded by love and respect. You’re saying you want struggling newborns to get the care they need to live long, vibrant, healthy lives. You, your family, your friends, your loved ones… all Manitobans count on St. Boniface Hospital. This is not just a lottery. It’s a community coming together to say it cares. Thank you for caring – and thank you for supporting St. Boniface Hospital Foundation! Published on February 15, 2018 at 12:00 am . 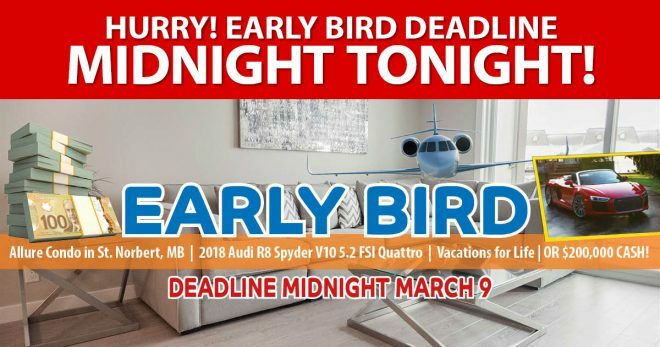 WINNIPEG, MB, February 15, 2018 — This is your last chance to get in to win the $61,000 Ultimate Bonus prize! Order your Mega Million Choices Lottery tickets today for an incredible choice of prizes — a 2018 Ford Mustang GT Premium Convertible or Volkswagen SUV Atlas, or vacations and tickets to the 2019 Super Bowl in Atlanta and 5 days in Italy, or $50,000 tax-free cash. 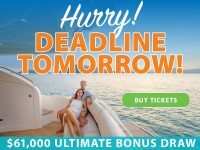 Plus, when you order, you’re automatically entered into all other draws, including the $230,000 Early Bird and $1.44 million Grand Prize draws, too! And remember the 50/50 Plus™, with a jackpot almost $650,000! Winner takes half! Visit the St-Boniface Mega Million Choices Lottery website for prize details. Ultimate Bonus deadline midnight Thursday, February 15. Published on February 13, 2018 at 10:00 pm . WINNIPEG, MB, February 14, 2018 — Make it a Valentine’s Day to remember by getting in to win the $61,000 Ultimate Bonus prize! Order your Mega Million Choices Lottery tickets today for an incredible choice of prizes — a 2018 Ford Mustang GT Premium Convertible or Volkswagen SUV Atlas, or vacations and tickets to the 2019 Super Bowl in Atlanta and 5 days in Italy, or $50,000 tax-free cash. 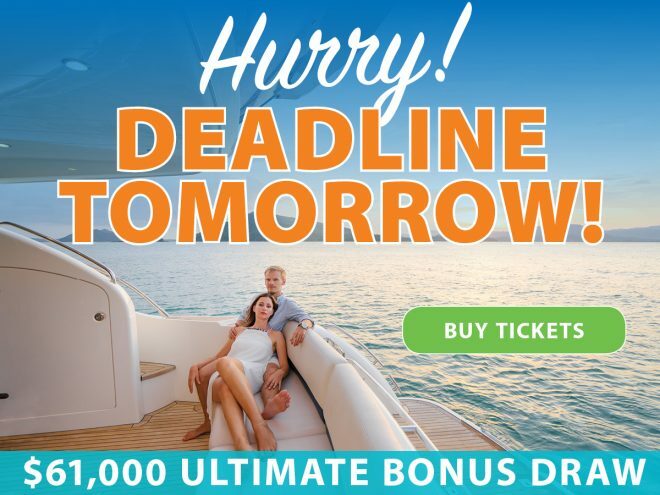 And don’t forget… when you order, you’re automatically entered into all other draws, including the $230,000 Early Bird and $1.44 million Grand Prize draws, too! There’s also the 50/50 Plus™, with a jackpot already over $616,000! Winner takes half! Act Fast – $32,000 Loyalty Bonus Deadline Tonight for the 2018 St-Boniface Mega Million Choices Lottery! Published on January 31, 2018 at 12:00 am . WINNIPEG, MB, January 31, 2018 — London is calling, and you have until Midnight TONIGHT to answer! The St-Boniface Mega Million Choices Lottery Loyalty Draw winner could jet off to London, England to experience the world famous Wimbledon Tennis Championships. Or, choose one of the other amazing prize options. But first, you have to buy your ticket before the deadline which is only hours away! 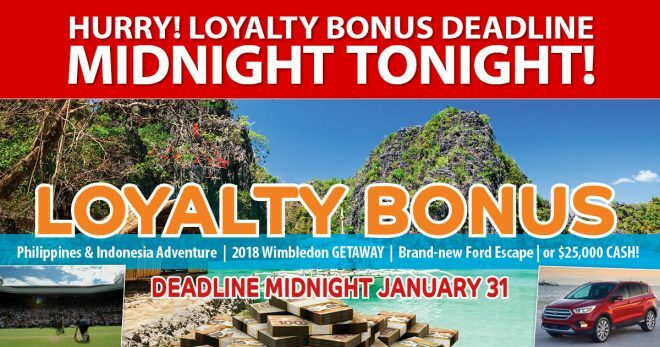 The Loyalty Bonus winner will have the choice between four incredible prize options. Choose between a 12-Day Philippines and Indonesia Adventure for Two (2) Adults (valued at $25,000) plus $5,000 Cash; OR a 6-Day 2018 Wimbledon Getaway for Two (2) Adults (valued at $23,547) plus $7,000 Cash; OR a 2018 Ford Escape SE 4WD (valued at $32,789); OR Choose $25,000 Cash! Buy your tickets before Midnight TONIGHT, Wednesday, January 31 to be eligible. You can order online or by phone at 204-256-7203 (Toll-Free: 1-855-256-7203). Once you have your ticket, you’ll be eligible in all the lottery draws, including the Ultimate Bonus, Early Bird, and Grand Prize Draw! Only 2 Days Left – $30,000 Loyalty Bonus Midnight Wednesday for the 2018 St-Boniface Mega Million Choices Lottery! Published on January 28, 2018 at 10:00 pm . WINNIPEG, MB, January 29, 2018 — If you’re a loyal supporter of the St-Boniface Mega Million Choices Lottery then you could soon be off to exotic South East Asia! The Loyalty Prize is worth over $32,000, and the deadline to enter the draw is coming up quickly. Buy your tickets before Midnight, Wednesday, January 31 to be eligible. You can order online or by phone at 204-256-7203 (Toll-Free: 1-855-256-7203). Tickets now on sale for the 2018 St-Boniface Mega Million Choices Lottery! Published on January 12, 2018 at 12:01 am . WINNIPEG, MB, January 12, 2018 — The St-Boniface Mega Million Choices Lottery is back with 3,310 prizes valued at $2,260,878.93. With SIX Grand Prize options to choose from, a $230,000 Early Bird prize, rides or cash, 69 Big Score plus winners, plus much more, this is a ticket you’ll want to get your hands on! See full article for details.